The global specialty ingredients market is prognosticate dto expand within the coming years. Some of the key players in the global specialty ingredients market are Royal DSM N.V. (The Netherlands), Archer Daniel Midland (U.S.), Kerry Groups (Irelands), Cargill Inc. (U.S.), E. I. DuPont de Nemours and Company (U.S.), Givaudan Flavors (Switzerland), CHR, Sensient Technologies (U.S.), Hansen (Denmark), Tate & Lyle PLC (U.K.). 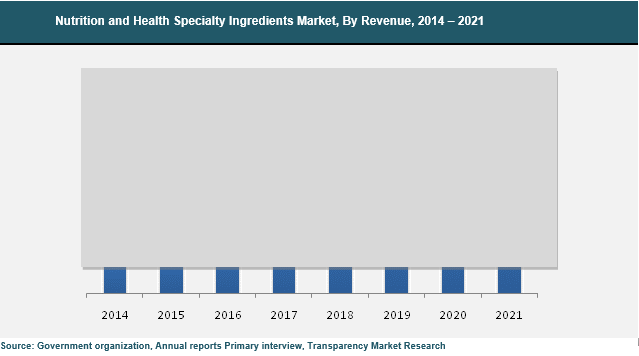 According to a recent report published by Transparency Market Research (TMR), the global specialty ingredients market is expected to develop at a CAGR of 6.60% within the forecast period from 2015 to 2021. As evaluated in 2014, the market was worth of US$205.2 bn. This figure is expected to reach around wortUS$320.6 bn by the end of forecast period, 2021. Based on function of various food ingredients global specialty food ingredients market is segmented into acidulants, color, starches and nutraceuticals, food enzymes, food preservatives, flavor, and food emulsifiers,. Among these, the nutraceuticals segment has the highest market share in specialty food ingredients. Geographically, North America holds the largest market share for specialty food ingredients, trailed by Asia Pacific and by Europe. The regions are foreseen to dominate the market due to rise in consumption of processed food items in the countries such as Canada and the U.S. The global specialty ingredients market is majorly propelled by factors for example rise in income levels of the people, rising health awareness among the population all over the world, and growing demand for anti-ageing cosmetics and other products. Increase in demand for nutrition and health, food and beverage, and personal care products has also boosted the growth of specialty ingredients market. Moreover, to preserve the nutrients, freshness, and flavor, specialty ingredients are utilized in food products. They are known to help prevention of wastage of food and improve the shelf life of the products. In several cases, more than two specialty ingredients are utilized for the betterment of food quality and protection. Along with that, the rise in demand for packaged food products is fueling the use of specialty food ingredients in the developing market. There has also been a surge in personal care elements, for example additives, anti-oxidants, antimicrobials, and several other refined ingredients. Besides, growing inclination towards organic products among buyers combined with their rising disposable income, offers high development potential for the improvement of personal care items planned with natural specialty ingredients. According to the current patterns coupled with market needs and advancing buyer’s needs is contributing in product differentiation, has boosted the development of the personal care ingredients market. Growing demand for natural specialty ingredients is anticipated to be high as consumers are moving from artificial to natural products as they don't contain toxic compounds. Also, because of the developing application of healthy skin, hair mind, beautifying agents, shower items, and scents, the request of common specialty ingredients is anticipated to stay high with a specific end goal to suit the particular needs of the buyers all around. Be that as it may, distinctive stringent government regulations has come up as a burden for the manufacturers to deal in the market.